In an effort to drop some pounds, I’ve started focusing on building muscle (instead of endurance) and therefore lifting weights. I understand the basic principle of why muscles get sore, but for me, and most people I know, 2 days after the work out seems to be FAR more painful than the day after. As with my other question, why is this, and is there anything I can do to prevent it? I would like to use this blog post to answer her question. There are three basic reasons why muscles get sore in response to exercise. First, there is a buildup of acid in muscles when they are forced to burn energy very quickly. The muscle soreness you experience during a workout is usually the result of acid buildup, but it quickly goes away as the acids are flushed out of your muscles. The second reason is a bit more long-term. Your muscles work by contracting. In order for your muscles to contract, calcium must be imported into the muscle cell. When the muscle relaxes, the calcium leaves the cell. So repeatedly contracting and relaxing your muscles (which is what you do when you exercise) causes calcium to continually enter and leave the cell. This produces a swelling in the muscle tissue, and that causes inflammation. In addition, this constant import and export of calcium serves as a trigger for the cell to break down proteins and rebuild them so that they can do more. This ends up building up the muscle, but at the cost of some pain. Neither of these effects explains what is happening in Black Sheep’s case, however. Black Sheep is experiencing Delayed Onset Muscle Soreness (DOMS), and it is the result of a completely different process. In short, DOMS is caused by small tears in your muscles, which isn’t nearly as bad as it sounds. Why do the tears occur? Are you mistreating your muscles? Not really. They are a consequence of eccentric exercise. To understand what that is, you need to know a bit more about how muscles contract. In the top part of the illustration, the muscle is relaxed. In order to contract, the “heads” on the myosin filament grab on to the actin filament and pull so that everything moves to the center. The result is the contracted muscle shown at the bottom of the illustration. This process, of course, takes energy, because the myosin heads have to do the grabbing and the pulling. So…imagine holding a weight in your hand with your arm fully extended down towards the ground. You now want to flex your elbow so as to lift the weight up. How do you do that? You contract your biceps muscle. The mysoin heads in your biceps muscle cells grab on to the actin and pull. They release, grab on again, and pull. They keep doing that, ratcheting the actins closer and closer to the center, which contracts your biceps. That flexes your elbow, bringing the weight up. Now you are ready to let your arm fall back to its original position. What do you do? Do you just immediately relax your biceps muscle and let gravity pull the weight down? That would certainly cause your arm to stretch back out, but your arm would flop down incredibly quickly, and that would jar your elbow joint. To keep that from happening, you relax your biceps, but you do so under tension. 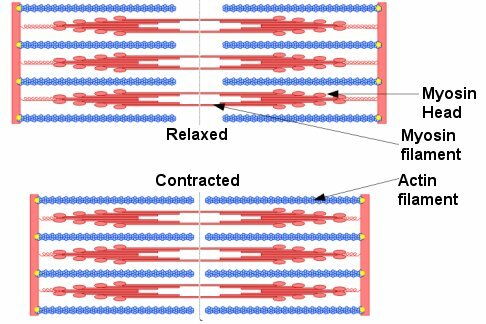 Some of the myosin fibers are fully relaxed, but not all of them. Some of them are still gripping the actin and pulling so as to keep your arm from just flopping down. So some of the muscle fibers are lengthening because they are relaxed, but others are still contracting. That’s eccentric exercise, and it tears up your muscles, because the muscle fibers are acting against each other rather than working with one another. Weightlifters spend a lot of time in eccentric exercise, because they are lifting and then slowly lowering the weights. Thus, lots of weightlifting tends to produce muscle damage. Now what does this muscle damage lead to? You guessed it – more muscle. The muscle cells have to get rid of the torn-up muscle parts and replace them. They typically replace them with even more protein fibers, increasing both muscle mass and strength. This kind of protein remodeling takes time, however, which is why the soreness is delayed. Is there anything you can do to prevent it? Not if you want to gain muscle mass. Tearing down muscles so that they can be rebuilt is part of the process of building muscle mass. Weightlifting shreds your muscles!!! Well, that’s all the more reason to sit in front of the TV and do no exercise then, isn’t it :P.
Does it make any difference whether you do your weight lifting quickly or slowly? Yes, Josiah, my muscles are in no danger of shredding! What makes a difference is what you do on the way down. While you are lifting, your muscle fibers are all working together, so no shredding is going on. The first two things I mentioned are going on, so you will experience pain, but the eccentric exercise is not going on, so no DOMS. When you are bringing the weights down, however, that’s when the eccentric exercise takes place, which is what causes the DOMS. The more slowly you do that, the more muscle tearing is going on and the more DOMS you will experience. Now Jay, that is the kind of article I could read all day. I love learning practical things that you can apply in life. I will share this with my son who is doing lots of training to prepare for the military. He has been doing it for years. I just love picturing the different parts of the muscles that are working… for person like me knowing more would help me to want to work out muscles. So, can you answer this question? Why is it so hard for women to get a tight (or tighter) tummy after babies? Now I understand all the stretching out… but I have heard that the muscles in the stomach area actually separate apart, and the only way to really pull them back together is through cosmetic surgery. Therefore, in this theory, if it is true, women can crunch, and twist, and sit up, etc. but they really can’t get it back to the tightness it was. Is this true? Thanks for your comment, Lindy. You are right that the stomach muscles often pull apart during pregnancy. This is technically called Diastasis Recti. However, cosmetic surgery is necessary only in extreme cases. Most cases of Diastasis Recti heal on their own. One study says that the proper exercise program during pregnancy can reduce the chance of Diastasis Recti. Why is it difficult to get the tight tummy back? Because since the muscles are stretched out (even if you don’t have Diastasis Recti), they need a lot of exercise to regain their tone. First, you need the right kind of exercise program. All the running in the world, for example, will not flatten your stomach after pregnancy. You need an exercise program specifically focused on your stomach muscles and their tone. That’s not enough, however. You also need the time to devote to it. If you don’t have both of those things, you won’t be able to get your muscles back into their proper tone. I studied about the lactic acid aspect in college biology this summer and a little about contracting muscles. I love the extra comprehensive information you’ve posted here! In respect to Lindy’s comment, my mother has said before that after childbirth is the one time a corset or girdle is a practical thing to wear, because it holds the muscles in as they go back into place/shape. I don’t think the cosmetic surgery racket is true. I think it is possible for women’s abdominal muscles to be “trained flat” again. Women don’t have the “bulk up” hormones that men have, but they can tone up. I know P90X is very effective because I’ve done the 90 day thing before. I prefer to do it in the winter months, however, because in the summer time I like to be out in the sunshine and swimming in our pool. Also, I get overheated very easily, so heavy working out in the summer time isn’t pleasant for me. Thanks for your comment, Amanda. Interestingly enough, specifically blaming lactic acid for short-term muscle pain is now controversial. It is clear that acids are the problem, but some biochemists say that the lactic acid isn’t the real culprit. Instead, when ATP (the molecule that is broken down to give the cell energy) is broken down quickly, the reactions that do the job promote the formation of other acids, and those acids are the real problem. I really haven’t studied it enough to decide whether or not this new idea is right. However, I have studied it enough to know there is a controversy. You are absolutely right that a flat stomach after pregnancy is possible in most women without cosmetic surgery. I am not familiar with the P90X program, but if it is at least partially targeted at building tone in the stomach muscles, it probably can be effective. The key is that since every person is different, it is possible that the exercise program that works for one woman will not work for another. You might have to try a variety of programs (or get help from a personal trainer) to find the one that is right for you. Wow, I had no idea all that was going on during workouts. Haha, that’s amazing. I did 90 days of the P90X workout as well, and I rather enjoyed it. Here is my question, I’ve heard that being submerged in warm water after an intense workout reduces the pain, is this true enough? Thanks for the comment Joseph. Being submerged in warm water does ease the pain of an intense workout. It relaxes tense muscles and also dilates some of your blood vessels (especially the ones close to the surface of your body). This allows more white blood cells to come to the places where your muscles are damaged, which aids in the removal of the damaged materials. Regarding Lindy’s question, I have personal experience with diastasis recti. After giving birth to five babies, I have this condition, and it has caused me so many problems. Julie is an expert on this condition, and she has helped so many women. I would recommend her program for both pregnant woman and postpartum mothers. I wish I had known about this program before I got pregnant with my first baby. It is much easier to prevent this problem in the first place. It is very important NOT to do any crunches or twisting if you have weakened abdominal muscles, as this will only make it worse. Thanks so much for the resource, Joy. I hope it finds its way to those who can benefit from it. This was an interesting post. In the process of researching health issues (particularly alternative cancer treatment), I have come across frequent discussion of acid and body chemistry, particularly lactic acid. I’m no biochemist, but from what I’ve read, most cancer patients have high blood glucose and over-acidic bodies, which apparently is both caused by and contributes to the cancer in a vicious cycle. Cancer seems to thrive in a sugary, acidic, low-oxygen environment, fermenting glucose into lactic acid that is converted by the liver to glucose, which feeds the cancer. The buildup of lactic acid may be a primary cause of fatigue in those afflicted with cancer. For those interested in further reading, here are a few online articles related to lactic acid and cancer. I can’t vouch for everything contained therein, but I think these researchers may truly be onto something that is often overlooked by the mainstream medical approach to diseases such as cancer. I’m particularly intrigued by the discussion of levorotatory versus dextrorotatory lactic acid and their relative merits and demerits to human health. For some time I wondered why one would want to consume products containing and/or inducing lactic acid (such as yogurt) if an excess of lactic acid can be harmful. But distinguishing the two types of lactic acid and their different effects makes sense and seems intriguing in terms of treating disease. Thanks for your comment, David. I am not a biochemist, either, but I know that it is pretty much impossible to have an “acidic body.” The pH of your blood and interstitial fluid (the fluid between cells) is tightly-regulated. It varies by less than 2%, or you die fairly quickly. While individual cells or small sections of tissue can have an overly acidic pH, even that can’t last long. Thus, I doubt that acidity has much to do with cancer, since most cancers are long-onset diseases. Short-term changes in small sections of the body don’t likely promote such long-onset diseases. I get rather skeptical of sources that treat all cancers the same, because there are a myriad of different cancers that have a myriad of different causes. Thus, when I see a source say that “cancer is caused by,” I become highly skeptical, since you can’t say that. One type of cancer is caused by one thing, and another type of cancer is caused by a completely different thing. I really don’t agree that glucose feeds cancer. Glucose feeds every cell in your body. Thus, if you have cancer, glucose will feed it, just like it feeds all cells. However, I don’t see any indication that it is preferential to cancer cells. I also think that cancers are more frequent in people with high glucose levels simply because obesity is linked to cancer, and it is also linked with diabetes. Most cancer researchers I have read think the obesity is the main link, not the glucose. Your first link is mostly a summary of a Science Daily article. It is fine, but the material underneath is not at all correct. Mitochondria do not produce lactic acid. Lactate is produced by a process called glycolysis, and that does not happen in the mitochondria. The lactate is then converted into lactic acid, and once again, that does not happen in the mitochondria. Both processes happen in the cytoplasm of the cell. The mitochondria are only involved when oxygen is present, and when that is the case, lactic acid is never made. The second article you linked contains many problems, the most important of which is the statement that “A tumour forms because someone is no longer producing adrenaline, which is needed to break down sugar.” Adrenaline has nothing to do with the breakdown of sugar! It is a hormone that is released when blood sugar levels are low. It causes the liver to convert glycogen into glucose so as to increase blood sugar levels. In order for the sugar to be broken down, it is then taken into the cells and goes through cellular respiration, which has nothing to do with adrenaline (which is more properly called epinephrine). Your third link also has some problems. Otto Heinrich Warburg did win the Nobel Prize, but it was for the work he did with respiratory enzymes. It had nothing to do with cancer surviving in low-oxygen conditions. He did hypothesize that “…for cancer, there is only one prime cause. Summarized in a few words, the prime cause of cancer is the replacement of the respiration of oxygen in normal body cells by a fermentation of sugar.” However, experimental evidence shows that while tumor cells do switch to glycolysis (which leads to fermentation), this is after the tumor is formed. Thus, it is certainly not a cause of cancer. Your last article is probably the most problematic. As the previous article did, this article mentions a real Nobel-Prize-Winner (it misspells his name, though), but his Nobel Prize had nothing to do with nutritional aspects of immunity. Once again, he did believe that aging and other problems are caused by toxic bacteria in the gut, and he did drink sour milk to try to keep those toxic gut bacteria away. However, he had noting to do with Kefir. Kefir was marketed much later. The discussion of lactic acid is questionable as well. It is true that lactic acid is chiral. Thus, it has a dextrorotatory isomer and a levorotatory isomer. However, body chemistry is very stereospecific, which means it typically uses only one isomer. For example, glucose is also chiral. The body metabolizes dextrorotatory glucose, but it simply ignores levorotatory glucose. It can’t do anything with it. I expect the same would be true for lactic acid, although I don’t know for sure. I can say this – if the body can use both isomers of lactic acid, then lactic acid is unlike most chiral molecules in the body. In the end, based on the biochemistry I know (which is limited, to say the least), I would say that these links are not reliable sources of medical information. Thank you for the lengthy and thoughtful response! I have to tread carefully here as I have not studied this out thoroughly enough to be able to have strong confidence in my views, however, my preliminary research does suggest a strong link between sugar and cancer. The lactic acid angle is not as clear, but I think there it likely there is something to that as well. Of note, Dr. Quillin asserts that “tumors are primarily obligate glucose metabolizers” and explains why controlling blood sugar levels is extremely important for someone battling cancer. He relies heavily on Otto Warburg’s work, indicating how the anaerobic fermentation produces excess lactic acid, which causes fatigue. Again, I don’t claim to be an expert here, but it seems fairly certain that controlling sugar and lactic acid levels is likely very important for cancer patients. Thanks, David. I will look at that chapter when I have some time. I am skeptical, but as always, real evidence will change my mind. Dr. Wile, based on a quick google search, it appears that the the L(or S depending on what you want to call it) enantiomer of lactic acid is the biologically active one. Therefore, one assumes that D/R lactic acid is ignored by the body. Also, I took biochem recently, and we talked very briefly about how there *may* be evidence that *some* cancer cells use only/mostly glycolysis, but that’s about the extent of what I remember about cancer and sugars. On a somewhat, but not very related note, is it possible to distinguish between enantiomers in NMR? For instance if I had a sample of pure (R)- 2-bromo-3-methylbutane would its NMR spectrum look any different from that of pure (S)-2-bromo-3-methylbutane or different from the NMR spectrum of the racemic mixture of the two? Thanks for your input, Vivielle. In answer to your question, traditional NMR cannot distinguish between enantiomers. Thus, R and S enantiomers have the same traditional NMR spectrum. However, if you use what are called “chiral alignment media,” you can. Here is a review article about that technique. Thanks so much for the article. I was going to make an educated guess that enantiomers would be indistinguishable by NMR. That article is very neat. Glad I could help, Vivielle! Great explanation as always Dr. Wile. Surprisingly, I actually was aware of the tearing process that occurs. Not all the details but I knew part of the soreness comes from the muscle tearing. It still seems odd to me though. It seems the pain would come when the muscle tears (which I guess it does. I’ve always hated, and wondered why my trainer insists I do the reps slowly instead of pumping them out as fast a possible, now it makes sense.) But if I understand correctly, you’re saying that the pain 2 days later is actually the body repairing itself. Is that correct? I am glad that you liked the post, Black Sheep. The time delay occurs because the torn-up muscle parts have to be broken down first. After that, an inflammation response is produced in order to get rid of the broken-down components. All this takes time. In addition, it takes time for the inflammation response to reach its full strength. While the inflammation response is occurring, new muscle parts are being built. The inflammation response is what is producing most of the pain, so the pain is more related to getting rid of the broken-down stuff than to the building of the new muscle parts. However, they tend to occur at the same time, which is why you can say that when you feel the pain, you know that new muscle is being produced. So the old adage, “No pain, no gain” is pretty accurate here.